‘This is the beginning. This is Act 1. 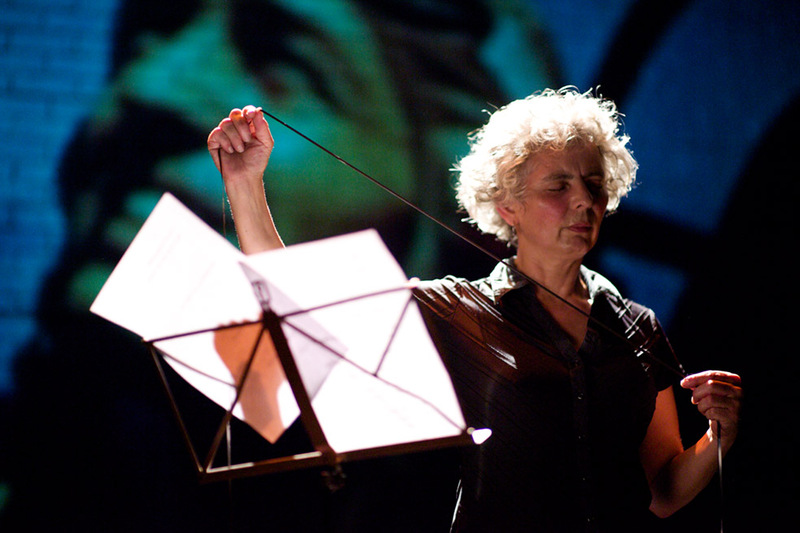 This is the bit where the lights go down and this is the bit where I turn around and walk to the back.’ Thus begins Wendy Houstoun’s 50 Acts; there is no artifice, just a slight inflection of her voice, but her delivery absorbs all our attention, drawing us inescapably into her world. This is one of the shorter of the fifty acts, some as brief as a stage direction and none longer than a Chopin Prelude. Collectively they contain tightly packed layers of poetry (Houstoun’s own), music clips, recorded interviews, political speeches, telephone messages, psychic consultation, health and safety regulations, and archival film that Houstoun (with lighting designer/production manager, Nigel Edwards) converts through the miracle of transubstantiation into a potent theatrical form exploring two of her bêtes noires: dangerous thinking around the issue of age and idiotic marketing speak. In As You Like It, Shakespeare wrote ‘All the world’s a stage, And all the men and women merely players: They have their exits and their entrances; And one man in his time plays many parts, His acts being seven ages.’ Like Shakespeare, Houstoun uses the stage, and her presence on it, as an analogy for life (‘how dare you take up centre stage when you are clearly middle aged…’) but concentrates her fifty acts on the latter ages (and some other irritations). ‘I am looking for a way to play this part where age doesn’t make any difference.’ She does, convincingly, because she is such a brilliant performer. Act 2 introduces us to Houstoun’s aphorisms, which appear as scrolling text on the screen behind her – almost too fast to read let alone write down, so I can’t really comment, but based on the quality of Houstoun’s live delivery, these aphorisms deserve more generous treatment. A book, perhaps? Dance Umbrella printed mugs and tee shirts? Ironically all I remember is ‘Time and space died yesterday.’ Act 3 is a triumphant yes yes yes, and Act 4 a defiant no no no. Act 5 is an affirmative yes to the human race and a sardonic yes to the rat race, in which silent film footage of crowds running in the streets haunts Houstoun who dashes about the stage to avoid them to the accompaniment of one of Chopin’s nimble Preludes. In Act 6 she feels her pulse. Chopin and Shakespeare are both big influences here. In Act 9 Houstoun recites a prologue in Shakespearean rhyming couplets: ‘…advancing time, which lazy thinking calls decline’ with a searing reference to old age as ‘sadfucks past their bloom…clogging up time’s waiting room.’ It also contains the first of many failed magic tricks to make herself disappear (‘the absence there for all to see.’). Like a consummate clown, she can get away with making people laugh at serious issues, even matters of life and death. It is easy to get caught up in watching Houstoun perform (the content of the piece) and not realise how carefully 50 Acts is constructed (the form). In her program note, Houstoun writes candidly that she has been trying to make this piece for some time. ‘Somehow the form meets the content in a way I have not achieved before (I have to thank Matteo Fargion for that).’ I have seen 50 Acts three times and each time it is slightly different, but this time I would concur with an audience member I overheard: ‘She absolutely nailed it.’ The form of each act — and of the whole — consists of a complex layering of meaning: sound effects, music, projected text and props reinforce Houstoun’s own finely-tuned speech. The advantage is that whereas she can only speak one word or phrase at a time, this vertical layering adds to her expressive palette like a painter applying impasto. Consider the broadcast, in the final acts, of platitudinous politicians defending austerity measures. The speech is overlaid with off-stage screams, the chiming of Big Ben, a spliced parliamentary chorus of Here! Here! and Peggy Lee singing Where or When? while Houstoun sits quietly waiting in the shadows of her final acts. The cumulative effect is such disillusion that it might come with a health warning were it not for Houstoun’s brand of dark humour. 50 Acts takes a break from the question of ageing to let off steam on another topic: ‘The world of questionnaires, idiotic marketing speak and non-stop initiative drivel has been driving us mad for some time so I am happy to get a little of this irritation out of my system.’ Houstoun dons a hard hat and an ANSI Class 2 safety vest, and cries, Heads! while samples of health and safety regulations like Do not carry loose objects scroll down the screen. She is subject to various assassination attempts from gunshots throughout the piece — one of the hazards of the job — and regularly checks her vital signs: putting a microphone to her heart on one occasion we hear a thumping beat; she puts it to her head and we hear an ambulance siren. Houstoun is not beyond making fun of herself to make a comment about our mental well-being. After the half-time interval, in which we remain in our seats watching Houstoun taking a breather, an alarm like a school bell sounds. Houstoun brings on a music stand with a score, a wooden stool with a pile of vinyl records and a hammer. We hear an interview in which two women are talking about our need to breathe more deeply and to use time as tendrils that we can pull out as a way of foreseeing the future. Houstoun is busy unraveling a cassette tape. There’s a drum roll followed by another Chopin Prelude. Houstoun stands with her eyes on the score, a hammer raised in her right hand and a vinyl record resting on the stool in the other. On an emphatic chord in the music she smashes the record with the hammer and prepares another, hitting the accents in the music (and the records) with perfect timing until the Prelude – and the pile of records – is finished. This is perhaps what she means by ‘getting a little of this irritation out of my system.’ She returns to the cassette tape, feeding its tendrils through her fingers like a medium looking into the future. ‘I’m getting a cross; it’s in the south: a southern cross…I’m getting a pension….no, no, I’m not getting a pension…I’m getting labels, labeled…I’m just getting the odd word now: tainted, cradle, grave, burden, tax…We’re in a dance hall, a palace of wasted steps…We’re doing the dance of the daft, the half-light limbo, the dead leg mambo, the go-and-get-pissed…All the steps are disappearing, one by one.’ Another, rather mournful Chopin Prelude now, and over the top Houstoun plays the end of a telephone message on her cassette player: Cheers then, lots of love which she rewinds and plays over and over again while bleached family photographs display on the screen. It is an act that has the poignancy of autobiography. We are on to end-of-life questionnaires on the screen: Did you find your life experience a) satisfactory or b) unsatisfactory? Your opinions are important to us. Another abortive disappearing trick leads to the sound of a woman sobbing overlaid by a voice saying, ‘Preview’. Houston tries one last time to disappear — in vain — before delivering a Shakespearean epilogue imagining the visible specks of dust floating in the spotlights are living entities from beyond who may ‘tell us things we need to learn.’ She places her microphone in the air and manages to pick up scraps of speech and thoughts, not always welcome. This is where the political speech on austerity begins, and Houstoun sits it out under a light at the back, doing a seated soft-shoe shuffle. Acts 47 and 48 flow into one another as the clock ticks inexorably. By Act 49 she is still seated as if in a waiting room. There is a drum roll, but no action. We reach Act 50. Houstoun is gently nodding. On the screen a series of suggestions on how to finish the act scrolls down the screen (more slowly, as time has taken a break). I could sidle off into the shadows…sing a gently lullaby so everyone feels cared for…rage against the dying of the light…like as the waves make towards the pebbled shore…recite a poem. No, that would be too wordy. Lights out. It is the performance of a lifetime.